Weds morning started out like any normal day. I had a Drs appointment in Jackson, MS an hrs drive north from my home. To understand the happenings, you need to know that Brookhaven is due south of Jackson on I-55, you pass through Crystal Springs, which is about 20 mins from my home... Hazelhurst and Wesson to get back to my house. You can exit I-55 at Crystal Springs and hit Hwy 51 a small 2 lane state Hwy. When I finished at the Drs. office I met my Grandson for lunch and was a little later than expected leaving Jackson, as I traveled south I decided I would get off the interstate and go to Wilson's Meat Market in Crystal Springs to stock my freezer while up that way. And then continue south on 51 to Wesson, I go to Wilson's about every 2 mos. and decided to go by then to save gas. As I exited the interstate at Crystal Springs, I noticed a young man sitting on the side of the road next to the Stop sign...you know the one's that hold up signs will work for food, this one was holding a sign saying stranded on road and hungry...(lol...my Grandson said, hungry is what caught my eye cause I try to feed everyone) usually I just keep going, but for some reason when I passed this young man, he caught my eye, he was about the age of my youngest son and his eyes just touched my heart, I've always heard that the eyes are the window to your soul. His were so sad, and empty and had so much shame in them...I did keep going, but for some reason I kept watching him in the mirror and I know in my heart I was not driving that car...I did something I'd never done or would ever do...I turned around and went back...all I had was $20.00 and I rolled the window down...when he can over and I handed it to him and told him that was all I had but I hoped it would help him...you could tell it surprised him, He asked me my name and told me his...I talked to him for about 10 mins. He might have been lying, but I really don't think so...he said he was from NC and his Granny had raised him, and now she was in a Nursing Home and he hadn't been home in 6 yrs. I told him he really needed to go home, he told me why he was on the road and how he had been asking God to help him, he was hungry and scared. I told him he need to go to the McDonald's down the road and get something to eat and stay until the storm blew over, at this time it was really getting cloudy and the wind was blowing hard, the radio had been telling about a storm front headed that way. So I told him God be with him and for him to think about going home. He told me God bless me for the help and I left. I don't know if he went to get something to eat or what but I headed to Hwy 51 to go to the meat market when I realized I had taken the wrong exit, 31 yrs of traveling that way and I took the north exit instead of the south exit, which took me longer to get to where I was going. To me that was a sign God had lead me to the young man. So I continued to the meat market and bought my groceries, just as I was getting into my car to go home, my husband called and wanted to know where I was..I told him I was leaving Wilson and he told me to stay there that a tornado had just hit Wesson...If I hadn't stopped to help a young man stranded on the road, I would have reached Wesson about the same time as the tornado touched down and it hit just about 1/2 mile north of Wesson on Hwy 51. I have wondered who God was saving.....the young man or me. Yes I still believe in Miracles. I love your header, is it your grand daughter? That was a miracle. Thank you for stopping by. Your new header is precious, Molly. It's always good to follow the Holy Spirit's tug. I love that story and it touched my heart - I have made a promise to give everyone asking for money a dollar when I go past them. It's hard to know what to do - but you just gave the money and let it go - makes my heart feel so good. My friend, what a sweet story...and so inspirational too! I believe in miracles too! I think they happen on a daily basis...all around us...it's just that sometimes we don't slow down long enough to see them! Wow...I just shudder to think what might have happened if God hadn't directed your path that day...with that tornado nearby! You know, I am often ridiculed for stopping to help the people that I see...the people with the signs, etc. But I can never pass one without thinking of the scripture where the Lord tells us to be careful...we may be entertaining angels unawares! I have always felt like it's a test to see if I'm paying attention! Thank you so much for sharing this great testimony of God's intervening power! I stand in awe...we serve an awesome God!!! 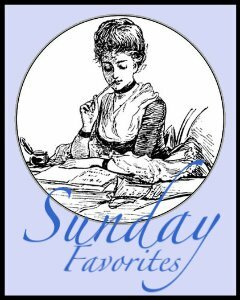 Thank you for joining in with Sunday Favorites this week, Molly!!! That was definitely a story worth repeating! God is so good! I came over from Chari's today and am so glad that I did. Your post is beautiful and had me in tears. Thank the good Lord above that he sent you in that direction for not only yourself but for that young man. I believe in miracles and know that God makes them all happen. He knows what is best and we often forget to listen to him at times. An angel in disguise,certainly.The Lord used you both to bless each other. My, God was so gracious in not only prompting you to speak to that young man and help him out with the twenty dollars, yet also to so graciously save you from the tornado!! God is so gracious and merciful and yes we do not know what, therefore by the grace of GOD, MAY HAVE HAPPENED TO MANY OF US! You are warmly invited to visit 'my little corner of the blogging world' some time! Molly this was certainly worth reposting! Isn't God's timing just perfect? Praise Him for you being here to tell us this story. Very touching story Molly. Sometimes it's very hard to stop and help people because we've all been lied to by those pretending to need help. I'm glad that you did and that it did keep you out of harm's way. What a touching story. Thanks so much for sharing!